New Jersey's weather headlines for Monday 10/3. Brighter, drier weather will return this week, but will Hurricane Matthew pass close enough to NJ next weekend to cause rain, wind, and surf impacts? The entire weekend was grey and damp, a continuation of the dreary weather that took hold of New Jersey late last week. Temperatures have held below normal since Thursday. We're starting off Monday with more cloudiness, along with patches of widespread thick fog. Visibility has been as low as a quarter-mile. As the sun comes up and temperatures start to rise, the fog should burn off by late morning. A few showers may try to cross the Delaware River into New Jersey too, but any rainfall will be widely scattered and light. The thick clouds will finally begin to break up by Monday afternoon - yes, the sun will shine again! That will push high temperatures to around 70 degrees - close to normal for early October. This clearing, drying, warming trend will continue for the next several days. Tuesday will be partly to mostly cloudy, with highs in the upper 60s. Wednesday and Thursday will bring mostly sunny skies, with thermometers warming to the lower 70s. I am cautiously optimistic that Matthew's forecast is becoming clearer. And I am cautiously optimistic that the forecast keeps the center of Matthew well east of New Jersey. But the key word here is "cautiously". As of 5 a.m. Monday, Matthew is still a powerful category 4 major hurricane with maximum sustained winds of 130 mph. The storm is now moving north - slowly but steadily - at 6 mph. Matthew will tear through Jamaica, Haiti, and Cuba from Monday to Tuesday. There are no big changes to report in the forecast track, with any Matthew impacts expected to affect New Jersey on Saturday and Sunday. Model consensus has shifted ever so slightly to the west (toward the coast), but not enough to warrant panic or raise serious alarm bells. My forecast continues to heavily favor the GFS ensemble solution. 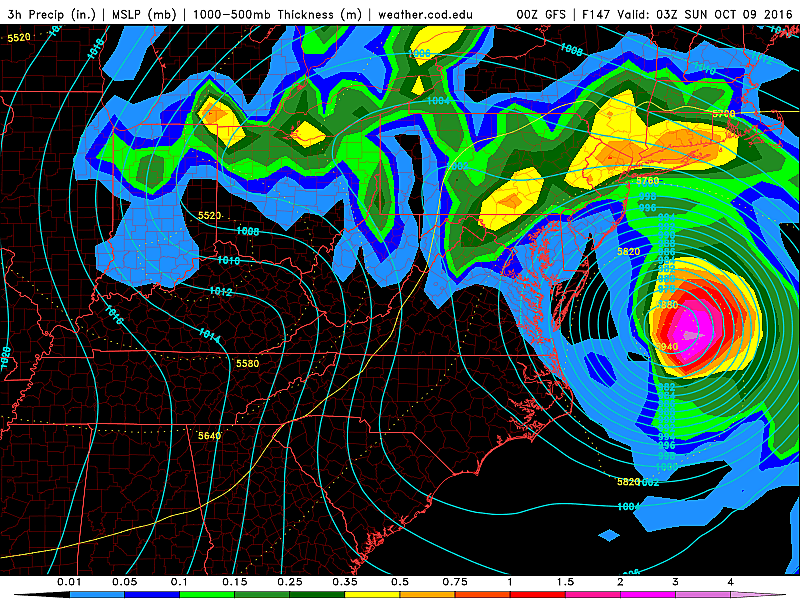 The GFS operational track is trending closer to the coast than most other models. And I am throwing the European model out the window for now - the much slower track just doesn't make sense, given the storm's strength and the synoptic setup over the eastern United States this week. Clearly the best-case scenario for New Jersey. If Matthew makes a right (eastward) turn upon tracking past the Carolinas, it would pose no direct threat to the Northeast United States. Wind: Speed depends on exact strength and location of the storm relative to the coast. Probably just breezy throughout New Jersey, with gusts to 30 mph. Surf: Even if Matthew stays hundreds of miles away from the Jersey Shore, rough surf may cause severe beach erosion. Even a foot or two of minor storm surge may cause minor to moderate coastal flooding. I'll call this the most likely scenario as of Monday morning. 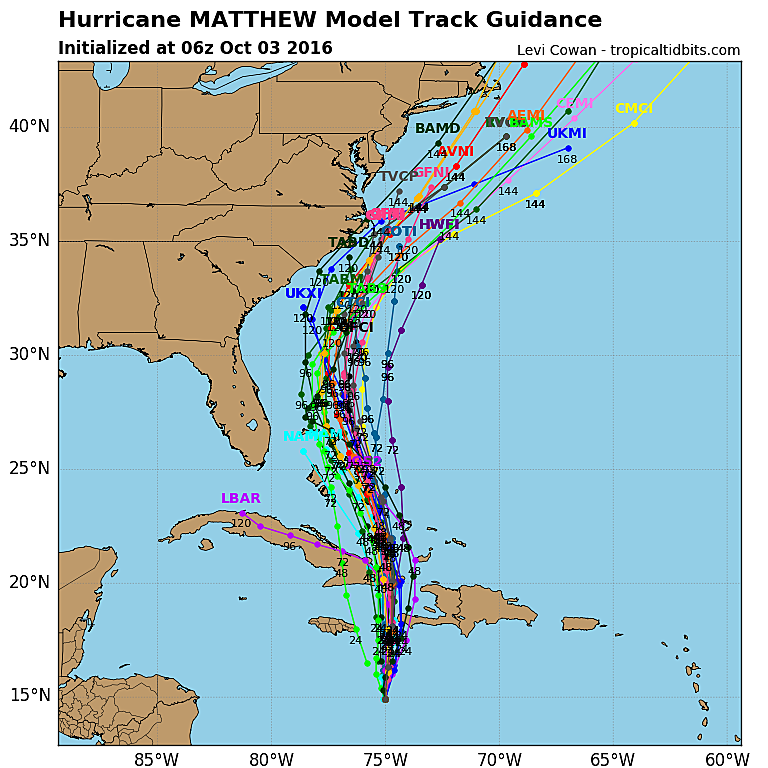 Similar to the above "out-to-sea" outcome, Matthew succumbs to a more easterly track after passing the Carolina coast. But, if the storm is too big, too strong, or doesn't veer out to sea enough, New Jersey could still feel the outer edges of Matthew as the storm passes by. Rain: A healthy 1 to 3 inches, especially along the coast. Wind: Tropical storm force. Gusts to 60 mph along the coast, 40 mph inland. Surf: Rough surf may cause severe beach erosion and moderate storm surge may cause moderate to major coastal flooding. Last week's forecast models were downright scary, at times showing Matthew passing directly over New Jersey. I'm very happy to say such a track is now unlikely, accordingly to the latest forecast data and analysis. However, it would be reckless and inappropriate to completely rule out a "wiggle" back to the west toward New Jersey. Rain: Tropical deluges could easily produce over a foot of rain. Wind: Hurricane force. Gusts of 90+ mph along the coast. Surf: Rough surf would likely cause severe beach erosion, while heavy storm surge would cause major coastal flooding and inundation. I continue to promote careful awareness this week, as Hurricane Matthew prepares to slide up the Atlantic seaboard. While the current forecast does not point to "big, bad" impacts for New Jersey, Matthew's strength and potential can not be underestimated. There's still lots of time for this forecast to evolve and wiggle back toward the coast. We will continue to keep you updated with the latest, on-air and online. If there's anything new to report Monday afternoon, we'll push out an update. Otherwise, our next comprehensive forecast blog is scheduled to be posted by 7 a.m. Tuesday.